"Roll out ceased on Aug 31 for now due to few problem cases with the security code. We are investigating the issue." "Yes we have intentionally stopped the roll out for now. We need to investigate and understand why half a dozen of devices have been requesting the security code after a seemingly successful update although the device lock had not been used previously. A couple of devices even indicate that they are permanently locked. The roll out will continue later. Apologies for the delay." Also edited was the already known issue about CallRecorder (3rd party OpenRepos app) preventing the update process, leaving Jolla to a state where it only boots to the logo screen. The app must be unistalled before updating the device. This issue was known, but now lifted to top on release notes for more visibility. Mobile Device Management (MDM): Targeted for corporate usage, this feature enables usage policies to certain device activities such as system updates, WLAN, sideloading of apps, sharing, location settings and more. The feature is not installed into the OS, but instead enabled via using API's in order to make MDM compatible with Sailfish OS. Upcoming calendar events: Jämsänjoki will now show you calendar events from upcoming days directly on your notification screen. 2017-08-24: 2.1.1.26 Released to Early access subscribers. OpenVPN improved. It might be in Russian language where "Jaem" was used to describe local people, and the name for the river might have followed as "Jaems-å" during Finland's time under Sweden. It might be in Lapland word "jámeš" which means a dead person. It might be in the name of the bigger lake where it currently flows. Lake "Päijänne" has been called earlier as "Pääjäämä" which translates to "main jem", again jem, or "jäämä", used for describing the people living by that lake. "The river of the jem's"
I did not uninstall or deactivate the autostart ability of CallRecorder App and the Update went through flawlessly. Should I be worried never the less and remove it? Thanks for letting us know. There are four versions of call recorder and the problem occurs at least with version 0.6. 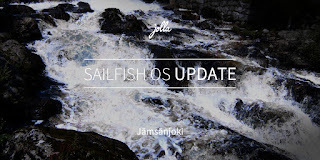 I also found this on TJC: "Having Call Recorder installed does not cause any SailfishOS update issue, having its demon (background task) running while updating SFOS does!"